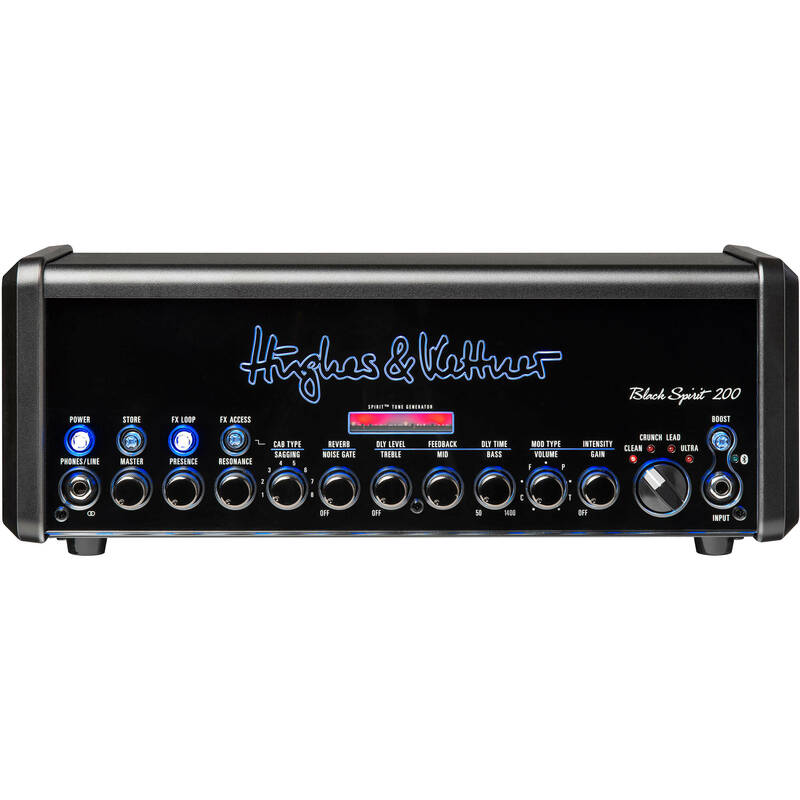 The Black Spirit 200 200-Watt Guitar Head from Hughes & Kettner is a four channel, solid state guitar amplifier that offers guitarists tones from pristine clean and classic rock crunches to searing lead tones and filthy metal madness. It can be used to power any speaker, from guitar cabs to active and passive PA speakers for live stage, home, rehearsal, and recording applications. Featuring a 1/4" instrument input, headphone output, and 1/8" auxiliary input, the Black Spirit 200 is built with a 3-pin XLR Red Box +AE DI output, a 1/4" speaker output, 1/4" FX loop send and return, and MIDI in/out and thru connectors. The DI is equipped with a mic/line and on/off switches. The 8- to 16-Ohm speaker output connector offers a switch for 2W, 20W, or 200W output so you can rock anywhere from your bedroom to the biggest stadiums. Additionally, the Black Spirit 200 200-Watt Guitar Head connects to any speaker from guitar cabs to active and passive PA speakers. At just under 8 lbs. this guitar head is easy to transport and will fit in your carry-on bag too. Much of the fascinating tone of the great clean, crunch, and lead guitar sounds is created by a drop in power supply voltage when spiking transient signals hit the output stage hard. Now, in an analog amp, the Black Spirit 200 lets you adjust the amount of power amp sag and dial-in creaminess and growl regardless of the volume level. Featuring four channels that take you on a trip through all the trademark tones of the last 60 years, the Black Spirit 200's channel-tailored boost will give you an even more assertive, creamier, or punchier tone. Four inspirational, strictly analog channels, plus a complete range of built-in digital reverb, delay, and modulation effects make it a perfect all-in-one solution, while a sophisticated FX loop lets you connect external FX units. And it's all accessible directly and with the trusted handling you expect from a real guitar amplifier. All parameters apart from the master volume can be stored in up to 128 presets and recalled any time you want. The Black Spirit 200 is the perfect solution on stage and for your sound library in the studio or at home. Recalling all your favorite Black Spirit 200 tones couldn't be simpler: just use the optional Hughes & Kettner FSM-432 MK III MIDI board (sold separately), where every one of your presets is the tap of a toe away. Hughes & Kettner's award-winning Red Box has been the music industry's go-to device for recording guitars without microphones for decades. Black Spirit 200 features the most highly evolved Red Box ever: Red Box AE+. It's the simplest and easiest way of sending your tone to a mixer, PA, or recording device. Choose from eight different cabinet types—from monstrous 4×12 stacks to compact 1×12 cabs, and anything in-between—to truly personalize your tone. This option is not only more convenient than miking up a cab. In most cases, it sounds a whole lot better. The Black Spirit 200 can drive any kind, size, and number of cabinets with a total impedance of 8 to 16 Ohms. With 200 watts of output power, the Black Spirit 200 is a loud guitar amplifier. Connect a guitar or a PA cabinet and always experience great tone. You can select the wattage from 2, 20, or 200 watts. Your personal connection to the Black Spirit 200 is matched in its totality only by the amp's connectivity to the musical world outside. Connect recording devices, mixing desks, in-ear systems, powered PA speakers, and powered studio monitors. Other connections include: guitar cabinets, non-powered PA and hi-fi speakers (in full-range mode), stereo headphones, studio monitors, aux inputs of hi-fi systems, any kind of stereo line level source, and Bluetooth audio streaming.